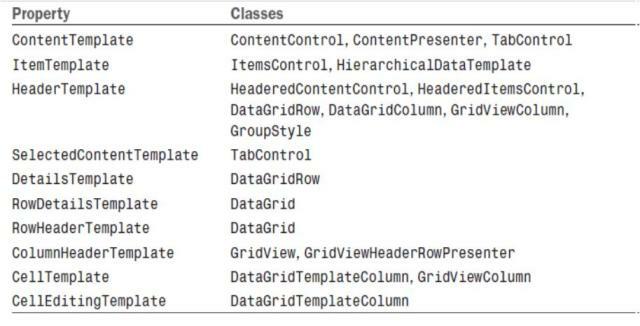 A data template is a piece of user interface that you’d like to apply to an arbitrary .NET object when it is rendered. Many WPF controls have properties (of type DataTemplate) for attaching a data template appropriately. For example, ContentControl has a ContentTemplate property for controlling the rendering of its Content object, and ItemsControl has an ItemTemplate that applies to each of its items. Value converters can morph a source value into a completely different target value. They enable you to plug in custom logic without giving up the benefits of data binding. Value converters are often used to reconcile a source and target that are different data types. For example, you could change the background or foreground color of an element based on the value of some non-Brush data source, much like conditional formatting in Microsoft Excel. 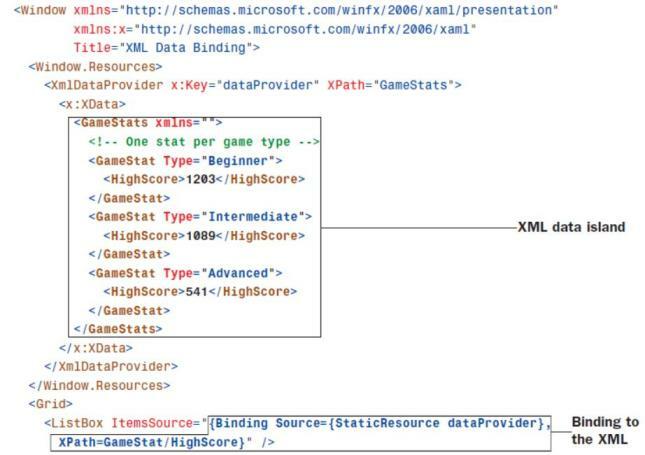 The XmlDataProvider is keyed off the name “booksResource” and using the XPath syntax (this is an XML standard), the XmlDataProvider represents all the child elements underneath the “” xml node in the file books.xml. We can now reference the XmlDataProvider using the StaticResource markup extension, and set our Grid’s DataContext to represent what the XmlDataProvider is returning back to us – all the child nodes under BooksList. Finally the ListBox inherits the DataContext from it’s parent Grid, but tweaks the data it wants to display – it only wants to display the Authors – so using the XPath syntax (see Appendix B) it further drills into the XML hierarchy to pull out all the Authors under the book nodes. If instead you wish to have the data directly in the file, you can embed it underneath the XmlDataProvider – there is one catch: you have to put xmlns=”” in your root tag so validation will be skipped for your data island. Whereas XmlDataProvider exposes XML as a data source, ObjectDataProvider exposes a .NET object as a data source. 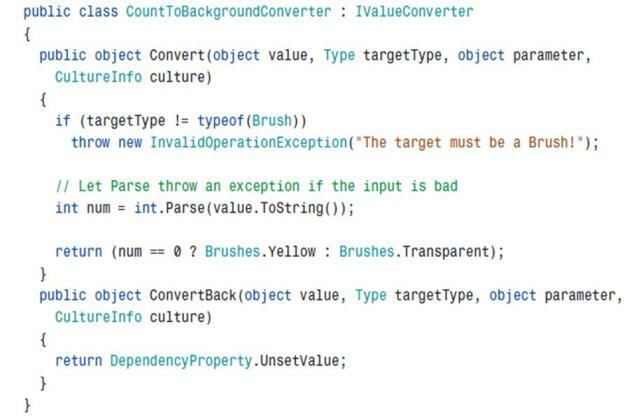 If parameters need to be passed to the method, you can use ObjectDataProvider’s MethodParameters property (which works just like its ConstructorParameters property). Specifying a Path in this case would apply to the instance returned by the method.